Knapp okay, etwas schwächer als das Debüt.<br>Symbiose zwischen Raggae, Funk und hauptsächlich Synthpop. Nearly a carbon copy of their first album but with a tad less energy, not great but not terrible either. There is a distinct continuation of the New Wave formula so prevalent on there first LP.<br><br>Yet the song arrangements have a more sophisticated structure to them. Proving the band was becoming more apt in the studio and tighter as a group in general (due to the vast amount of live performances the band where doing at the time).<br><br>The albums highlights would definitely be the opening track (and lead single) "Stay Young" and the title track "Underneath The Colours". Overall not a bad album considering most artists struggle with "the difficult second album syndrome", INXS where progressing and moving forward..... good things where just on the horizon. I found this a bit of a chore to listen to. Which is strange because it's not far below the quality of the previous album which I didn't think was a chore to listen to. 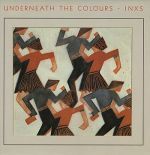 Like with "INXS" it's enjoyable and has its highlights (those being "Horizons", "Night Of Rebellion", "What Would You Do" and "Just To Learn Again") and lowlights (those being "Follow", "Big Go Go" and the title track). Overall a small drop in quality from the previous album but still fairly enjoyable. Probably wouldn't ever listen to it again though.